Galganov's Easy Recipe for the French Fried Potatoes! 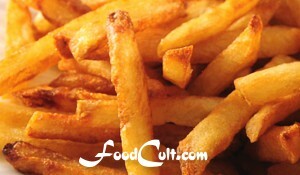 Slice fries uniformly as practical (shown here is hand-cut to 3/16 to 1/4" [5 to 7 cm]) or chip them in a potato chipper. Wash raw, cut potatoes well in cold water and let soak in very cold water (refridgerate if you have space). This step is more important if potatoes are not very fresh/firm but always wash them. We always try to soak them at least an hour. In your Deep Fryer - Heat oil to 360oF (180o C) and drain raw potatoes very well. In a wok - As oil gets hot drop one piece of raw potato into the oil. When it rises to the top and is enveloped in foam the oil is hot enough. Carefully slide your raw potato sticks into the hot oil (Do not over-fill. Increased product in the oil increases the risk of splashing). Stir only enough to turn potato pieces for even cooking. Fry approximately six (6) minutes - until the surface of the fries starts to bubble and the potato is just starting to change colour. Transfer to the colander to drain off excess oil and let stand to cool. With oil reheated to cooking temperature, drop chips back into hot oil and cook until they form a crisp surface (about three  minutes depending upon the size of the chips - these slender ones go pretty fast). Remove fries to the colander to drain off execess oil and then transfer them to an uncoated paper bag. Add small amounts of any seasoning (salt, pepper and/or finely minced herbs) to the bag and shake and slide the fries until the bag is greasy. 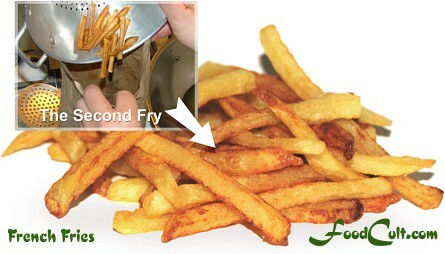 Remove fries to serving dish or dinner plate. Oil must be sufficiently hot. Insufficiently heated oil makes greasy fries. Oil which is too hot will cook the outside without cooking the inside. Increase the heat very slightly on the second fry to create a crispier "shell" on the potato. Cooking times cannot be exact. Time to cook depends upon potato variety, humidity, sugar content, oil type, how the potato is cut (size and shape) etc. Of course, for a Quebecer, your Patates Frites, traditionally served with white vinegar and salt, is the foundation for Poutine - simply mix some of your favourite diced cheese curds into your prepared Frites and pour your favourite gravy over it. It should go without saying ... but it doesn't, "A sealed deep fryer, used as directed by the manufacturer, continues to be amongst the safest ways to deep fry at home." We like, sometimes, to fry in a wok. Of the stove-top options, we think that the wok (used as directed by the manufacturer) is one of the more economical and safer ways to deep fry ... but you must NEVER walk away from any deep frier whether sealed or stove-top. deep frying can be dangerous! If you choose to fry in a wok, don't overload it. You must leave sufficient room to allow the potato pieces to move around in the oil (to cook evenly). Additionally, handling more product in the oil is more likely to lead to dangerous oil splashes. You only need about 1" (2.5 cm) of oil in a wok. We do not deep fry in a pot as we think it to be a less safe option. Never allow children to deep fry alone. Always have emergency equipment (an extinguisher, appropriate pot/wok lids, baking soda) at hand in the event of emergency. Pick the perfect sandwich to go with your fries!